Should You Hire a Natural Light Photographer? There are many different types of photographers out there. Most choose to specialize in something, whether it’s weddings or portrait or commercial work. No matter what their specialty, all good photographers should have an above average understanding of light and how to use it or create it. While searching for a portrait or wedding photographer, you might come across photographers describing themselves as “natural light photographers”. While there are great natural light photographers out there, here are some things you should know before you sign your name to a contract. Almost all portrait and wedding photographers prefer to use natural light whenever the available light creates beautiful photos. Not only is natural light beautiful under the right circumstances, it’s really the easiest in terms of set-up. No extra equipment required. No good photographer would pass up natural light for bulky light set-up if they didn’t need to. The truth is that many natural light photographers are natural light photographers because they don’t know how to use lighting. Now, this isn’t always the case and I don’t say this to demean those who consider themselves natural light photographers. But, this is a big deal if – for instance – your wedding reception will take place indoors or after dark. Today’s camera technology is pretty good but not good enough to allow a proper exposure without lighting after the sun is long gone. Most reception lighting isn’t adequate for good exposure. Committing to natural light photography can leave you with fewer options. If you are getting married at a venue with a variety of gorgeous photo spots, half of those spots might be ruled out by a natural light photographer if the lighting isn’t adequate. A dark getting-ready room could mean that you have no amazing shots of your hair and makeup session or at the very least, the photographer will have to pull you outside for time consuming recreations. My point is, natural light is great when it’s available and beautiful. But unless you are getting married outside on a long July day, a natural light photographer might not make the most sense. Here is a great example. The two images shot below were test shots that I quickly fired off to test the quality of the natural light before beginning portraits of this bride. These images are straight out of camera, no exposure edits. The image on the left is with just the natural light in the room. The image on the right was with a single, lightweight off camera fill flash that I was able to set up in just a minute or two. 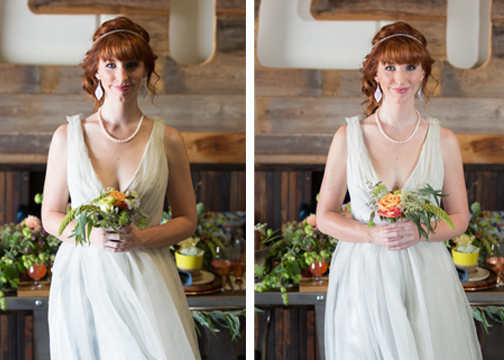 While the quality of light on the left is still beautiful, it causes me to lose half of the bride’s face. Yes, I could face her more towards the light source but then I don’t have control of what I want in the background. By having the option to set up lighting, I can better control the kind of photo I’m trying to create. So when choosing your photographer, it’s always a good idea to ask questions. 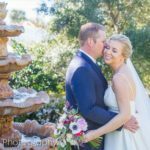 Find out what the specific light challenges will be throughout your wedding day or photography session and ask your photographer how they will compensate for those issues. Not only will this give you more confidence in who you hire, it will also help to insure that you are happy with the end results!